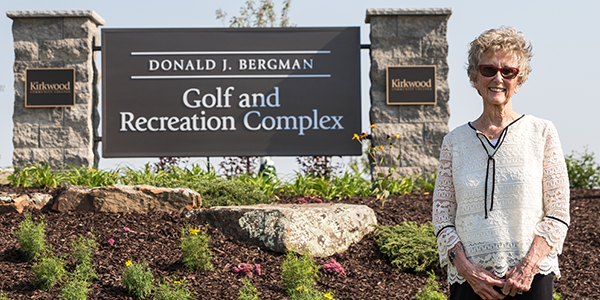 CEDAR RAPIDS, Iowa (September 15, 2017)-Kirkwood Community College dedicated the new Donald J. Bergman Golf & Recreation Complex in a ceremony on the college's main campus on September 14. The dedication, attended by college leaders, community partners and the Bergman family, was in honor of a memorial gift to the college for student scholarships. The new complex, located across from The Hotel at Kirkwood Center and west of the Kirkwood Horticulture facility, will create more recreational opportunities for students. The area will include a two-hole golf course, a one-mile fitness and interpretive trail, two intramural fields, and dedicated areas for volleyball, basketball and other sports. It will also serve as a hands-on laboratory for Kirkwood agriculture students. At the event, Kirkwood President Mick Starcevich thanked the Bergman family for their generous support of Kirkwood. "Miriam Bergman has established an endowed scholarship in memory of her husband Don, a man who dedicated his career to mentoring young people as a high school guidance counselor and coach," said Starcevich. "In recognition of this generous gift, and Don's passion for coaching golf, we are pleased host a permanent legacy for Don with this beautiful new golf and recreation complex." The complex will be available to students, faculty and staff. Guests staying at the Hotel at Kirkwood Center will also be able to take advantage of the new recreation area. "Thanks to the generosity of Miriam Bergman in memory of her husband Don, this complex will carry his name and permanently show Don Bergman's legacy of care and compassion," said Kirkwood Vice President of Development Kathy Hall. "Kirkwood is the perfect place to continue his legacy as he was a great advocate for Kirkwood and its mission."